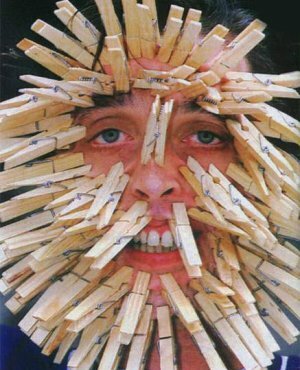 You ever wonder what someone means when they call someone a real pin head? Okay now that you've looked leave me a comment...or two...or three. We'll pinpoint a winner Saturday. My boss told me I should add some clip art to my presentation to our prospective client. How's this? The non-medicinal alternative to Botox treatments. Tom mocks his mother's punishment of helping her hang the laundry. LMBO! This one is just making me LAUGH. Hard. And then I read 00dozo's Osama Pin Laden and that almost made me pee my pants! The red neck version of a [clothes] pin girl. FAIL. What are you looking at? Do i have something on my nose? Put on Broadway Plays in your. own. home! Available for immediate shipment, the first release of Play-In-A-Box from Ronco--Lion King edition. Call now, operators standing by. Not the brightest kid in school, Seymour was sadly mistaken in his interpretation of "getting a woody". My boss made me clean my desk today... I'm pissed at the world, and I got nothin. I know, strange, but seriosly, nothin. Coincidentally, the number of pins on Joe's face was exactly the same as his IQ. Thanks to the credit crunch, Clive Barker's "Hellraiser" didn't have nearly the budget that his 1987 film did.